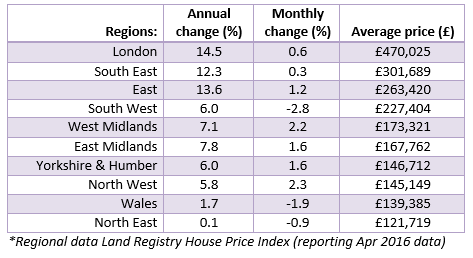 Latest house price indices from Halifax, Nationwide and Rightmove all report prices up in June. While there is a declining trend in the number of house sales in recent months, demand from buyers has been running ahead of housing supply keeping upward price pressure on house prices. While there was no immediate fall off in house prices ahead of the referendum, we take a look at the outlook ahead. Before the referendum vote, there were already signs of fewer house sales in April and May compared with the previous year. What is not clear, is whether this is a natural tapering off given the surge in house sales in March ahead of the introduction of Stamp Duty on second homes on 1st April. Even with a drop in transactions in April and May, HMRC seasonally adjusted UK property transactions for March-May 2016 are 13.4% higher than the same period in 2015. Looking forward, it will be difficult to identify whether a fall in transactions in the months ahead is because buyers brought forward purchases early in 2016 to avoid additional stamp duty or whether any fall off in transactions is a function of economic concerns caused by the referendum result. Ahead of the referendum vote, there appears to be uncertainty among potential homesellers. 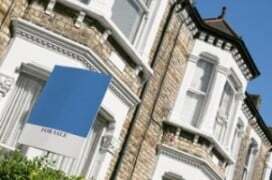 Rightmove report June new seller numbers 5.3% below the monthly average for this time of year. Owners of bigger homes are most reluctant to put homes on the market with a 6.6% drop among these sellers. Seasonally adjusted housing starts in England are down ahead of the referendum. Housing starts are estimated at 35,530 in the March quarter 2016. Compared to a year ago, starts this quarter are down by 9% (DCLG House Building March Quarter 2016 England). The lack of homes on the market is likely to keep upward pressure on house prices even if demand softens in the months ahead. Economists are predicting that the Bank of England is likely to cut interest rates by 0.25 percent within the next week to help stimulate the economy. Certainly, interest rates are expected to remain low and this should help with mortgage affordability. In the short term, we can expect interest rates to remain low, housing stock to remain tight and both buyers and sellers to be cautious. It is likely the number of transactions will continue to drop in the months ahead and that the pace of house price growth will slow as in previous periods of uncertainty. Just last year, the rate of house price growth slowed between January and August 2015. This followed the introduction of stricter mortgage lending rules, an expected interest rate rise and uncertainty of the outcome of the general election. The rate of growth of house prices shifted from an average annual rise of 7.9% to an average annual rise of 4.9% by August. The average annual rise in house prices was 7.8% in May according to the House Price Watch report and we will likely see this gradually drop to 5.0% over the next four to six months. Early reports from Halifax, Nationwide and Rightmove report house prices up in June (+1.3% Halifax, +0.2% Nationwide and +0.8% Rightmove) so it is likely any slowdown will begin in July. Regions with the biggest rate of growth in house prices include London (14.5%), the East of England (13.6%) and the South East (12.3%). There tends to be a north-south divide on house prices and it is unclear whether Brexit is likely to change this pattern. There is speculation London may be most impacted by Brexit. Investment properties, those owned by landlords and overseas buyers, play a bigger role in the London market. A drop in the value of sterling makes it cheaper for foreign investors to buy property but it also means a drop in the value of rental income some investors rely on (collected in sterling). Employment in the capital has been running ahead of other regions up 17% since the 2007 crisis, compared to 6% in the UK overall according to Nationwide. It is not clear what the impact on jobs in London and other regions will be post Brexit. The UK economy may be slowing and if job losses materialise then we could see more significant drops in house prices. House prices reportedly fell 16% following the 2007 banking collapse. We would not expect the drop to be as significant as this as there was a tightening of lending coinciding with the 2007 drop. The likelihood of continued low interest rates, limited supply and the controls put in place for restricted lending following the 2007 crisis puts us in a much better place. However, a stall to house price growth is possible. The average annual rate of house price growth in May was 7.8% and we could see this drop to 0% if the economy falters and unemployment rises. However, we are entering uncharted territory. If EU negotiations look to be going well and there is less impact on the economy than initially expected, we could see a bounce in demand. With tight supply, we could see house prices rise sharply again in just a few months. From a slowdown of 5.0% back up to 7.8% average annual rate of growth. 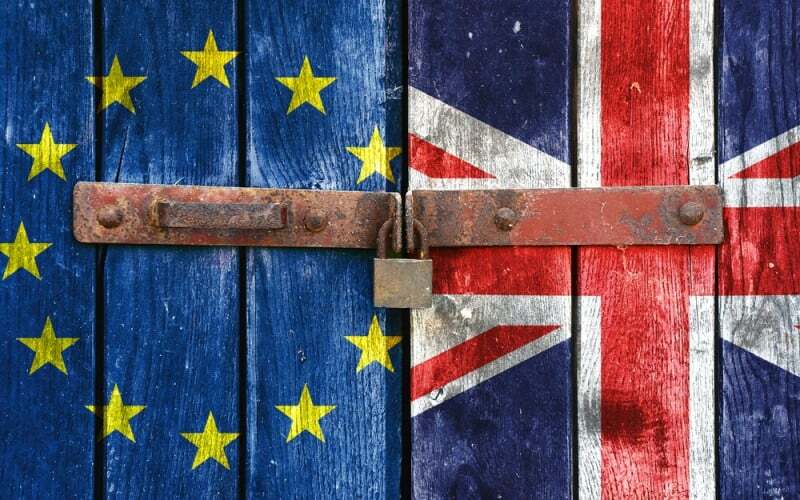 It is natural that there will be some hesitancy among both sellers and buyers for a few months until the result of the referendum begins to play out in the economy and we see the likely outcome of the EU negotiations. Working at BHS – what impact will changes have on my mortgage?